Hi everyone, I'm really happy to meet you! My name is Zin, short for "Zinfandel", because I came to SaveABunny from the wine country in Napa. I am elegant and very "full-bodied." I go with the flow and am very sweet. 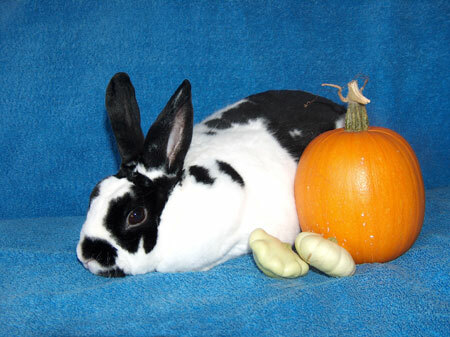 I'm a gentle and easy to handle, neutered boy with dashing looks and a "sparkling" personality. You'll find me a relaxing and soothing companion and a five star addition to your family. I am pictured with a sample of the latest harvest from the SaveABunny garden. If you live in the San Francisco Bay area and like to garden, you can volunteer to help our garden grow.